Everyone seems to love Nightcrawler, Dan Gilroy’s 2014 crime thriller starring Jake Gyllenhaal. At the time of writing, it holds a 95% “Certified Fresh” rating on Rotten Tomatoes, based on 223 reviews. Their summary says it “offers dark, thought-provoking thrills”. It was even nominated for the Best Original Screenplay Oscar. I feel like I have to mention all this, because I’m at a complete loss: the film I watched last night, on Blu-ray, didn’t offer me any thrills – least of all dark, thought-provoking ones. I guess what I’m saying is, I’m having a bit of a crisis of confidence, here. If you watch the trailer and think Nightcrawler looks like your kind of film, you shouldn’t necessarily take my word for it. That said, if you watch it and end up hating it, don’t say I didn’t warn you. Out now on DVD and Blu-ray comes Nightcrawler, and follows Louis “Lou” Bloom, a character who ticks every single box on the “movie sociopath” checklist, despite Gyllenhaal’s protestations that Bloom isn’t a sociopath. The first time we meet Bloom, a security guard catches him breaking into a construction site to steal scrap metal. Seconds later, the security guard is tackled to the ground. Moments after that, Bloom drives away wearing the guard’s designer watch. That’s the kind of guy Lou Bloom is. After happening upon a film crew shooting footage of a car accident, Bloom is inspired to give up thieving and become a stringer – a freelance cameraman who sells footage to news networks. Bloom hires a desperate/naïve young guy called Rick (Riz Ahmed) as his assistant and has him eavesdrop on police radio channels to try to source the bloodiest, most compelling footage possible. He resorts to fabricating crime scenes in a bid to get the perfect shot. He coerces a morning news director (Rene Russo) into sleeping with him, in exchange for the footage she knows will save her career. And that’s basically it. The film sort of plods along, with no real emotional peaks and troughs to speak of. Even the ending only really registers as “mildly surprising”: it fits far too neatly into the patterns established by the rest of the film to have much of an effect. 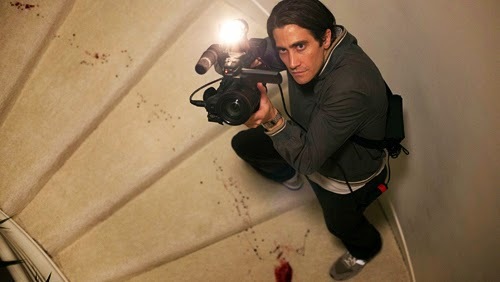 There’s some interest to be had from trying to get into Lou Bloom’s head and figure out what makes him tick, and from watching his stunted interactions with the other characters, but it’s the same sort of interest you might get from reading an article or watching a nature documentary – I certainly can’t find anything that would make Nightcrawler “a modern masterpiece” (TwitchFilm), “deliriously thrilling” (The Playlist), or worthy of “★★★★★” (Empire). I just don’t get it. Even the film’s apparent message (“hey, you guys, the media is a bit evil!”) feels like an afterthought – which is surprising, considering the film was clearly built around it – and it’s been done in better, more interesting ways elsewhere. I’m giving Nightcrawler one star for being attractive and well put-together, and a second star for being well-acted throughout. Gyllenhaal skilfully treads the line between likeable and creepy, whilst Ahmed – whom you might know from Four Lions or Channel 4’s Dead Set – delivers a quite frankly excellent performance as innocent, uncertain Rick. And that’s it. 2/5. I’ll leave it to you to figure out where those other three stars keep coming from.